Corona’s Cayla Barnes was named the Best Defenseman at this year’s IIHF Under-18 Women’s World Championship, which was showcased from Jan. 8-15 in St. Catharines, Ontario. A member of the U.S. team, Barnes tied for the tournament lead in assists (six) as the Americans skated to a gold-medal performance at the event, which culminated in a 3-2 overtime triumph over Canada in the championship game. Team USA forged a perfect 5-0 record at the tournament, outscoring its opponents 23-3. 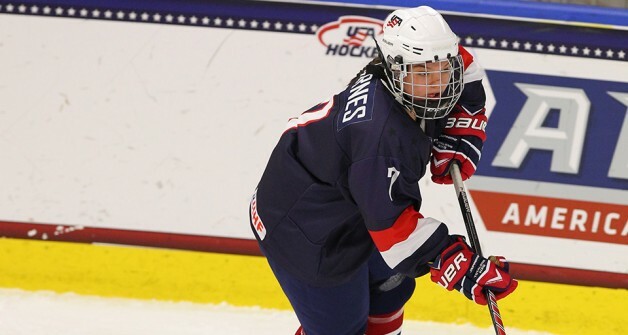 A 1999-born who was also recognized as one of Team USA’s top players of the tournament, Barnes is in her junior year at New Hampshire’s New Hampton School and also playing in the New England Women’s Hockey League on the East Coast Wizards’ 16U AAA team. Barnes, who has committed to play her NCAA Division I hockey at Boston College, was also a member of last year’s U.S. Women’s National Under-18 Team that struck gold in Buffalo.